With far more than 7 years from our foundation, the University Residence Balcony of the Romeral is one of the accommodation options and services a lot more consolidated for students inside the city of Malaga. Top tip: taxi drivers are not too sure of the location, so take a map that you can point to when you first arrive. 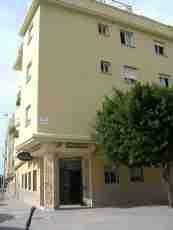 Stayed here during the Feria and it was excellent value for money, located about 20 minutes walk from the evening Feria site. The staff (mum, dad and daughter) were friendly and helpful. Clean towels offered every day, but no change of bedding over the five days I stayed (probably due to my being in my room in the morning when the cleaners were doing their thing and their not wanting to disturb me - in any case I didn't need it). Air con in the room and shared bathrooms and toilets - all spotlessly clean. Showers were mental: too hot to stand under, or died away to a trickle, then coming back on after a minute or two. You get used to them. Breakfast was ample and the coffee was good. The hostel is located outside the city centre, but there are regular buses to town within a couple of minutes walk (the 8 or the 20, fare about 1 euro). Hostel was far enough away from town and the beach that I tended to go out for the whole day and not return again until the evening, but this is still practical as it's only 15 minutes on the bus. Plenty of bars and restaurants near the hostel, all relatively inexpensive. I would definitely go back if staying in Malaga again. Cheap, nice staff and close to the bus-stop - easy to visit the rest of the city! The rooms are on the ground floor. There are a lot of restaurant and bar nearby. On the one hand it is advantage, on the other hand, it is disadvantage, because it is a little bit noisy. On the web site the rooms are described as private room but there was only 6 bathroom (and 6 toilet) for approximately 35 rooms! The price/value ratio is good. The downtown is far (I think, the distance may be 5 km). There are bus lines in Malaga at night but I don't know whether the hostel can be reached by them. The staff does not speak English, only Spanish. It was extremely clean and the rooms were separate, so your belongings are very safe. Spotlessly clean, quiet and private, university / safe area, excellent choice of nearby cafes, bars and restaurants. good public transport to centro malaga and aeropuerto. University students resident. Excellent value. * Residencia Universitaria Balcon del Romeral rated 4 out of 5 based on 6 customer reviews. Hostel reviews with a star rating are sourced from HostelBookers. If you find Residencia Universitaria Balcon del Romeral with the same booking conditions at a lower rate somewhere else on the internet after you have booked, we will refund you the total difference.